Endoparasitoids of beetle larva (Coleoptera) or less commonly fly larva (Mycetophilidae: Diptera). Buffington ML & Copeland RS. 2016. 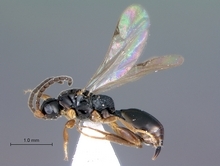 Redescription of Helorus ruficornis Förster (Hymenoptera: Heloridae), with a new synonymy and new Afrotropical specimen records. Johnson, N.F. 1992. Catalog of world Proctotrupoidea excluding Platygastridae. Memoirs of the American Entomological Institute 51: 1-825. Kieffer, J. J. 1904. Nouveaux proctotrypides myrmécophiles. Bull. Soc. Hist. Nat. Metz 23: 31-58. Kolyada, V.A., Mostovski, M.B., & Brothers, D.J. 2004. New data on proctotrupid wasp genus Exallonyx Kieffer (Hymenoptera: Proctotrupidae) from South Africa, with description of a new species and new synonymy. African Invertebrates. 45: 237-248. Kolyada, V. A., & Mostovski M.B. 2007. On a putative Gondwanan relic Afroserphus bicornis Masner (Hymenoptera: Proctotrupidae), with a description of the hitherto unknown female. African Invertebrates 48(2): 261-265. Masner, L. 1961. Proctotrupidae. Key to the genera of the world (Hymenoptera Proctotrupoidea). Exploration Parc National de l' Upemba Mission G. F. de Witte 1946-1949 60(4): 37-47.
collection of L. A. G. Bosc d’Antic. Zoosystema 29: 457-470. Risbec J. 1950. Contribution à l’étude des Proctotrupidae (Serphidae) : Proctotrupidés de la section technique d’Agriculture tropicale (A. O. F.) et Proctotrupidés du Muséum national d’Histoire naturelle (Afrique et Colonies françaises), in Sagot R. & Risbec J. (eds), Travaux du laboratoire d’entomologie du secteur soudanais de recherches agronomiques. Gouvernement général de l’Afrique occidentale française: 509-639. Sundholm, A. 1970. Hymenoptera. Proctotrupidae. In: Hanstrom, B, Brink, P. & Rudebeck, G. (eds.) South African Animal Life. Lund: Berlingska Boktryckeriet 14: 306-401. Townes, H.K. 1977. A revision of the Heloridae (Hymenoptera). Contributions of the American Entomological Institute 15: 1-12. Townes, H.K. & M. Townes. 1981. A revision of the Serphidae (Hymenoptera). Memoirs of the American Entomological Institute 32: 1-541.